I had recently written a couple of blog posts about building cloud native applications and microservices. Those blog posts were mostly high level overview posts, leaving out the low level implementation details. This blog post will be a first in a series of blog posts where I will talk about some of my favorite technologies for building cloud native applications and give examples of how to use them. As you may have noticed by previous blog posts, I am a fan of Spring Boot and the simplicity it provides when building Java apps. One of the Spring projects which builds upon Boot and that has been rapidly evolving over the past year plus is Spring Cloud. 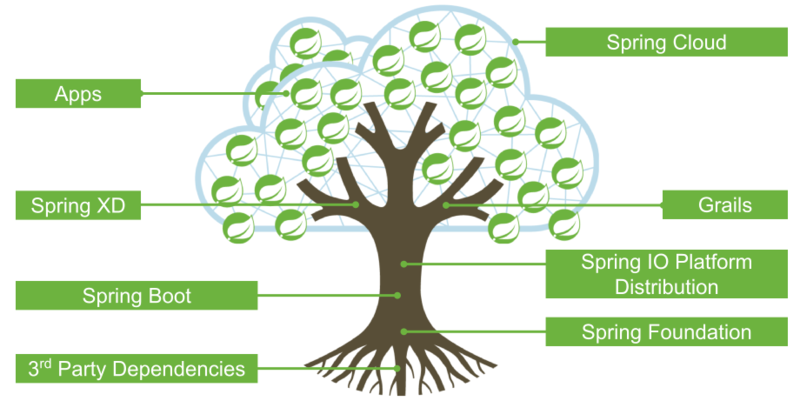 The overall goal of the Spring Cloud project is to allow you to build cloud native applications with Spring Boot. Here is a nice diagram (courtesy of some slides from Dave Syer and Spencer Gibb) which explains where Spring Cloud fits in the overall Spring architecture. As you might be able to tell by this feature list, many of these features have to do with building cloud native apps using microservices. If you would like to learn more about Spring Cloud there are a number of good session recordings that you can listen to. Here is one from Josh Long and another from Spencer Gibb. Getting started with Spring Cloud is relatively easy, especially if you are already familiar with Spring Boot. If you head over to start.spring.io you will be brought to a page that will basically bootstrap your Spring Boot app just by filling out a form. The Spring team has integrated the Spring Cloud projects into this tool, allowing you to use them in your Spring Boot app if you choose. In this blog post, and in a number of follow up posts, we will create a basic microservice app using Spring Boot and Spring Cloud. One of my interests outside of technology is obstacle course racing, so in the spirit of that interest, lets create a web app which lists some upcoming obstacle course races and participants in those races. There will be three “services” that make up the app, one producing the list of races, one which produces the participants in those races, and one that serves clients (browsers) the front-end code. Lets get started creating the three services. First, go to start.spring.io and fill out the form like the image below. The only check box you will need to check off is the one named “Web”. Then click the Generate button to download the zip file containing the source for your Spring Boot project. You can then import this project into your favorite IDE, I like to use STS, but you can use plain Eclipse or any other Java IDE as well as long as it supports Maven. There will be one source file in the package com.ryanjbaxter.spring.cloud.ocr.races called OcrRacesApplication.java. Open that up and copy the below code into it. The application will start on localhost using port 8080, so if you open your browser and go to http://localhost:8080/ you should see a JSON list returned with the race details. We are going to have many services running at the same time on the same machine and they can’t all run on the same port, so lets customize the port the races service will run on. In the src/main/resources directory of the app there will be a file called application.properties. This is where you can set various properties of your Spring app. I prefer to use YAML files instead (less typing) so rename this file to application.yml. Then open the file and add the following two lines to it. Now if you restart your app it should start on port 8282. The next service we want to create is our race participants service. Again head back to start.spring.io and fill out the form like the image below. Click the Generate button to download the code for your project and import it into your IDE. Again, there will be a single source file in the package com.ryanjbaxter.spring.cloud.ocr.participants called OcrParticipantsApplication.java. Open this file and copy the code below into it. This class is similar to the same class in the races service, except here we are working with participants. Again we don’t want this app to start on port 8080 so in src/main/resources rename application.properties to application.yml and add these two lines. If you start this application and go to http://localhost:8181/ you will see all participants. In addition if you go to http://localhost:8181/races/123 you will see just the participants who will be racing in the race with id 123. The final service we are going to create is a service which serves the client-side browser code. Our web app will be built using Angular.js. Again, we will create a new project from start.spring.io. Fill out the form following the screen shot below. Open rename application.properties to application.yml and add the following two lines. In src/main/resources/static create the directories scripts/controllers and views. In scripts/controllers create a new file called main.js and add the following code. In the scripts directory create a new file called app.js and add the following code. In the views directory create a file called main.html and add the following code. In the static directory create a new file called index.html and add the following code. If you start this application and go to http://localhost:8080 you will see a simple page that just says hello world. Now it is time to try to leverage some of the services we created in our front-end. One of the first things we want to do is list all the races. In the web app service open main.js and add the following code. Here all we are doing is calling our races service to get the list of races and assigning it to a variable in our scope. Start your races service app and the web app service and go to http://localhost:8080. If you open your browsers console you will see the following error. Cross-Origin Request Blocked: The Same Origin Policy disallows reading the remote resource at http://localhost:8282/races. (Reason: CORS header ‘Access-Control-Allow-Origin’ missing). If you are a web developer you are probably very familiar with this error. All modern browsers prevent AJAX requests to other domains unless the server on that domain has specifically allowed requests to come from your domain, this is called the same-origin policy. In this case we are making a request from localhost:8080 to localhost:8282 and the server at localhost:8282 has not said it allows requests coming from localhost:8080. We could enable CORS (cross-origin resource sharing) in our races service so we can make requests to it from localhost:8080, but this becomes quite messy. What happens when we deploy to production or test? Those are additional domains we have to enable as well. Since we can theoretically be talking to many, many microservices from the client side code we will have to do this for each service. In addition, it is not uncommon in a microservices application to have services evolve and change over time, so while the races service is located at a specific URL today, that might not be the case in the future. In short, hardcoding the URL to the service in our client side code and enabling CORS is just not going to cut it. Luckily Spring Cloud has a very clean and robust solution available to us. To solve the problem of hard coding URLs in our client side code, or anywhere in our application, we will want to use service discovery. Service discovery allows services to query a central location for a complete list of services that are available and the URL(s) those services are available at. To solve the cross domain problem it would be nice if we had a simple reverse proxy on the same domain as our web app that leveraged the service discovery service to route requests to the right service. We can use two projects that are part of Spring Cloud Netflix to do just that. The Spring Cloud Netflix Eureka project will allow us to easily setup a service discovery service for our application while Spring Cloud Netflix Zuul sets up a reverse proxy that integrates with Eureka to call services. In the next blog post we will take a look at how to integrate these two Spring Cloud projects into our application to solve our cross domain problem.